Probably the worlds best roofing company! Shingle roofs are generally low maintenance and a popular cost-effective roofing material. Two commonly known shingle types are, Three Tab and Dimensional (or Architectural) shingles. Both types of shingles come in a variety of colors. 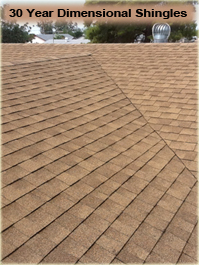 Three Tab shingles are flat and have a 2 dimensional look. They have a running row pattern with the notches in the shingles also creating a vertical line appearance. Dimensional shingles have a more textured, kind of small square appearance. 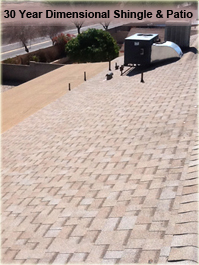 They are a thicker, heavier, a multi-layer laminated shingle, making them less susceptible to curling and wind damage. As the sun shines on Dimensional Shingles the layers cast shadows creating color depth and variation throughout the roof. The shingles are the primary protector against weather, so quality, proper nailing, and installation are important to prevent leaks and minimize the chances of wind blown shingles. We professionally install shingles, edge metal, felt underlayment, appropriate flashing, and properly seal pipes, T-tops, A/C Units, swamp coolers, wind turbines, skylights, chimneys, etc. to ensure the roof is watertight. Our professional roofers are trained and supervised by our Licensed Roofing Contractor so repairs or newly shingled roofs will be installed properly with excellent craftsmanship and attention to details that will provide a long lasting roof. If you are considering a Re-roof, there may also be the option of what is called an overlay. If there is only one layer of shingles currently on the roof you may have the option to install a second layer of shingles on top of the first layer. This eliminates the need for removing the current roofing material and can reduce the cost of the Re-roof. An overlay still gives you the benefits of a new roof and the added protection of the underlying materials. Talk with our Licensed Roofing Contractor if you are interested in an overlay as a possible roofing solution for your situation. Maintenance on a properly installed shingle roof can be minimal. Check your roof occasionally and after high wind storms. Watch for debris, branches, missing or torn shingles, bird dropping build-up, and other potential concerns. Prompt attention to these things can minimize the cost of repairs to the roof and help prevent further damage. As the roof ages, or if a leak occurs, it is possible that penetrations (pipes, vents, A/C etc.) may need to be re-sealed before the shingle roof needs to be replaced. Our experienced roofing contractor can inspect your roofs penetrations, and will check for cracked or curling shingles. Patio roofs are also a part of many homes. There are several options, and types of low-sloped patio roofs available. Some of the more common types are Torch Down, Cold Process, and Rolled Roofing. 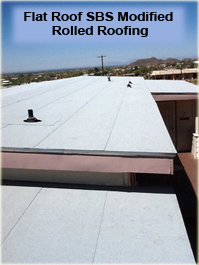 Talk with our Licensed Roofing Contractor about installation for these types and other flat roof options. Rolled roofing is a popular cost-effective choice for a patio roof. 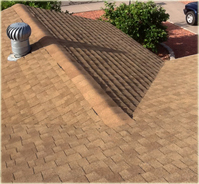 There are different types of rolled roofing and a color options. A couple choices are regular rolled roofing, which comes in different weights (thickness) and SBS Modified Rolled Roofing. SBS Modified has rubberized modifiers in the material giving it added strength and elasticity in extreme weather conditions with a longer life span and is generally worth the few extra dollars. When you call us you will speak directly to our Licensed Roofing Contractor with over 15 Years of roofing experience. Whether you are looking for a simple repair, overlay, or Re-roof you will receive experienced knowledgeable answers about your concerns. We offer free estimates, liberal warranties, efficient service, competitive pricing, and quality materials, including your choice of shingles and color. We understand that your time is important and strive for minimal disruption during your project. Respecting your property, jobsite cleanliness, your satisfaction and professionalism are of primary concern to our company and our roofing employees. Primarily servicing the Phoenix East Valley including Gold Canyon, Apache Junction, Mesa, Gilbert, Chandler, Tempe, Fountain Hills, Scottsdale, Phoenix, San Tan Valley, Queen Creek, AZ.